Closely-held ReVENT Medical expects to begin a U.S. pivotal trial in the first half next year with its minimally invasive surgical solution to treat obstructive sleep apnea (OSA). “OSA is the most common type of sleep apnea and is caused by an obstruction of the upper airway, originating in the palate and/or the tongue,” CEO, Charlie Rampersaud, says in an interview with BioTuesdays.com. Mr. Rampersaud explains that the ReVENT Sleep Apnea System consists of four implants in the tongue and the procedure is performed by an ear, nose and throat (ENT) surgeon, usually as an out-patient procedure in 15 minutes or so, with a recovery time of one-to-three days. The implants are inserted using a minimally invasive technique and are designed to provide a light spring-like force to the tongue tissue. After the implants heal into place with the looped ends acting as an anchoring mechanism, the bio-absorbable sections between the looped ends of the implants erode, allowing the implants to gently contract over time. “The spring-like force is designed to maintain an open airway by preventing tongue collapse, but not be noticed by the patient, when speaking or swallowing,” Mr. Rampersaud contends. The implant is available in different sizes and is intended as a permanent implant in the tongue base. In an earlier two-year feasibility study, leading up to CE Mark, 40 patients were treated in Germany, the Czech Republic and Canada. Mr. Rampersaud says results out to 24 months have demonstrated lasting, statistically significant clinical improvement, without any reports of foreign body sensation or difficulties with speech or swallowing. The ReVENT Sleep Apnea System received CE mark in 2013 for its latest generation system, and the company began a soft launch in Germany in spring 2014 through an ENT distributor at selected medical centers with a high self-pay history. ReVENT is currently conducting a post-marketing study at 15 sites in Europe, with enrolment of approximately 50 subjects set for completion in the summer of 2016. Indeed, he says early data from the current post-marketing study are demonstrating success rates much higher than the first study, and substantially better than any mainline surgical treatment option. The post-marketing study will aid in marketing, fundraising, and physician acceptance of the technology and will also support reimbursement. Earlier this month, ReVENT filed an application for reimbursement in Germany under the NUB process for new diagnostic and treatment methods. “Hopefully, we will receive reimbursement next spring and start a robust commercial launch,” he adds. Following its post-marketing study, the company plans to introduce its sleep apnea device in Italy, Switzerland and Belgium, initially as a self-pay treatment and followed by formal reimbursement. In the U.S., the FDA classifies the ReVENT Sleep Apnea System as a Class 2 medical device. Mr. Rampersaud says a pre-investigational device exemption (IDE) meeting with the FDA in January 2015 confirmed a clear 510(k) regulatory pathway and the FDA agreed in principle to ReVENT’s protocol strategy for a pivotal trial. “We submitted the IDE, and anticipate the ability to commence the pivotal study in the first half of 2016, with the goal of 510k approval in late 2017 or early 2018,” he adds. ReVENT is currently seeking to raise $5-million to $15-million in a series C financing to complete the post-marketing study and launch its pivotal study in the U.S. Equity investments to date have totaled about $20-million. “Our technology is a compelling portfolio fit for leaders in this sector and we have had discussions with some of them,” he contends. The current standard of care for OSA is continuous positive airway pressure (CPAP). Mr. Rampersaud suggests that the approximately 50% of patients not compliant with CPAP have limited treatment options, resulting in a significant proportion of non-compliant patients going untreated or without adequate treatment. “We are not targeting the CPAP market but rather the non-compliant market,” he suggests. Specifically, he says the company’s initial target market is the 850,000 non-compliant patients in the U.S. with dominant tongue base closure, representing a market potential of almost $2-billion annually. 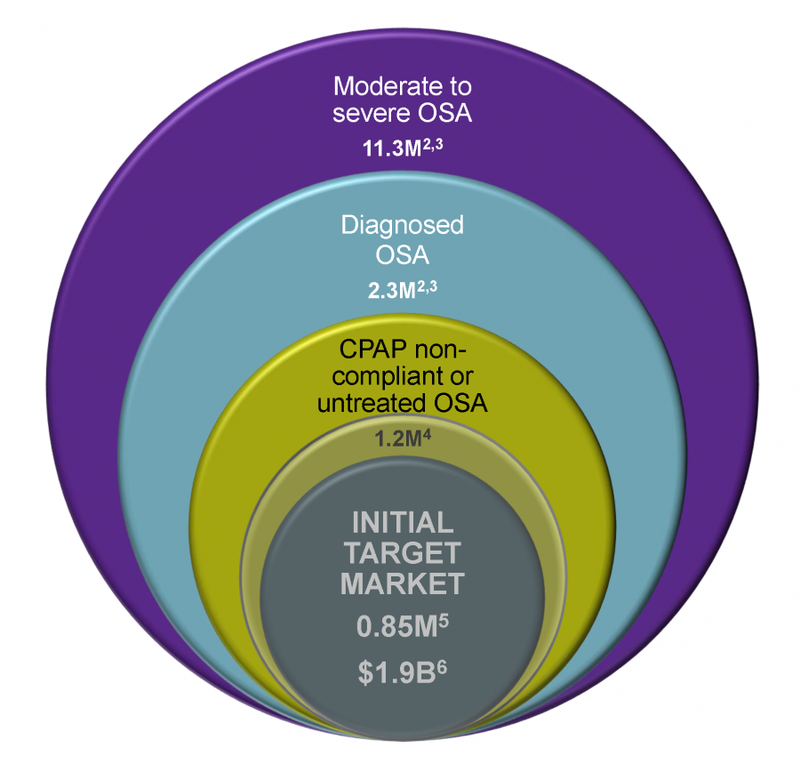 The economic burden of untreated OSA in the U.S. is estimated at more than $65-billion a year. Comorbidities include diabetes, obesity, hypertension, stroke, heart disease and an increased risk of death. For example, untreated OSA can increase the risk of stroke and cardiovascular disease by 3.5 times.